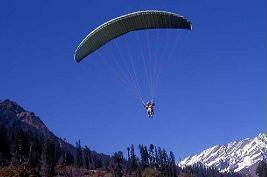 Paragliding and Hand Gliding are two popular Adventurous sports in Himachal Pradesh. If you too want to fly in the sky and fell the cool breeze then come here to Bir and Billing in the Kangra Valley which is very famous for Paragliding. Also, this place is known as the Indian capital of Aero sports because Hand gliding and Paragliding are the two major sports which are conducted here. There are also some certain rules which one should follow before getting the ride of Paragliding and Hand Gliding. One with a little effort one can easily reach up to the sky. 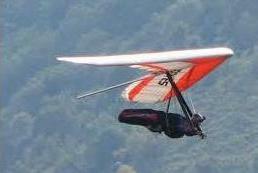 Paragliding is one among popular aero sports of Himachal Pradesh. One can easily enjoy this sport by going to Kangra Valley of Himachal Pradesh. Also, two other places where paragliding is popular are Bundla Dhar near Bilaspur and Intkali in the Pabbar valley. The best time to experience paragliding is between May to June and September to October. Bir and Billing are the two places which are known as Paragliding capital of India. This place has earlier organized three international and five national rallies of Hand gliding. Kullu in Himachal Pradesh is also a major spot for paragliding. In Kullu , you can have the experience of paragliding in top hills like Bijli Mahadev, Rohtang Pass, Kothi and Solang Nallah. Also, for the beginners there is a special spot of paragliding in Solang and Bijli Mahadev. Bilaspur is also very famous for this sport. One important thing to keep in mind is that one should be more than 15 years of age and should be having the weight between 45 kg to 85kg. You can ride upto the height of 20,000 ft for nearly 20 to 30 minutes. Every year during the month of November, Himachal Pradesh Tourism Department conducts Himalayan Paragliding Pre World Event in Bir and Billing. Hand Gliding is another important sport of Himachal Pradesh. Every year thousands of people come here to experience the fun hand gliding. This sport can be experienced when the air currents moves the glider towards the sky. No engine backup is needed for this. The main spots where this sport is popular are Billing and Dharamkot in Himachal Pradesh. Bir and Billing in Kangra Valley has already conducted three international and five national hand gliding rallies. Tourism and Travel department of Himachal Pradesh also conducts many other sports here. The mental and physical fitness is very important to do this sport. The important things which are required for doing this sport are a glider, a harness, a safety helmet, a life jacket, a variometer, ankle support shoes and rough clothing. to get awesome experience of flying.